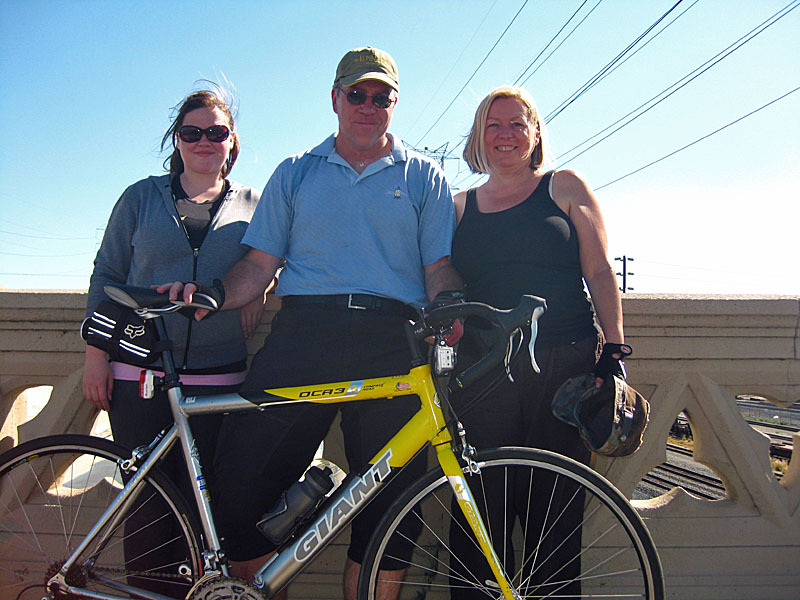 What a pleasure it was to have my daughter Katie over for a visit and for her to join Susan and I during Sunday’s third CicLAvia. As such we decided to load the truck up with our bikes and drive down close to the route, parking near 3rd and Rampart and pedaling to the course at 6th. Since we didn’t get rolling until after 1 p.m. we stopped for lunch at Mama’s Tamales on 7th for lunch and then casually rolled to the middle of 4th Street Bridge where we hung out for a spell under an absolutely gorgeous day before retracing our steps back to where we started. And yes, indeed. As evidenced by the photo above ’twas the first time in I can’t remember how long that I rode a bike without a helmet. But if there’s any place where a helmet might be optional, it’s on the CicLAvia course. Frustratingly I found out after the fact that my GoPro cam’s memory card filled up prematurely, which means I had forgotten to clear it of Friday’s long ride up to Baldwin Hills Scenic Overlook. As a result, the timelapse video above ends a couple blocks before arriving at the bridge. This entry was posted on Monday, October 10th, 2011 at 2:42 pm and is filed under biking, family, milestones. You can follow any responses to this entry through the RSS 2.0 feed. Both comments and pings are currently closed.